“Day of” planning is not a thing. This can be such a tricky conversation but, after having two opportunities in the last week to explain the differences of what I do and what some people refer to as day of planning, I decided to write this blog post to educate brides, mothers of brides, grooms, wedding attendees, and anyone else who stumbles upon this. Let’s face it - weddings are a big investment. You could be the most organized person in the whole world, but if you have never planned a wedding before, you need a qualified and dedicated planner to protect the investment you’re making, to put in the legwork to ensure it is everything you dreamt of, to orchestrate smooth and seamless transitions throughout, and to be your support so that you can relax and live in the moment (stress free!) on your wedding day. So very simply, no professional planner worth your time or money is going to just show up on the day of the wedding to “run the show” and “make sure the cake shows up”. Here’s the good news: “month of” coordination exists! This is one of the biggest differences between a professional planner and someone who is just organized and likes weddings. I take the time to really learn the “why” behind your choices for the wedding, your family dynamics, your personalities, and what you envision the perfect wedding day to be. Armed with this deep understanding, I am able to confidently make decisions you would feel comfortable with when changes need to be made day-of on the fly (which happens more than people think). True story: Last June, I had a bride who wanted nothing more than to get married outdoors. 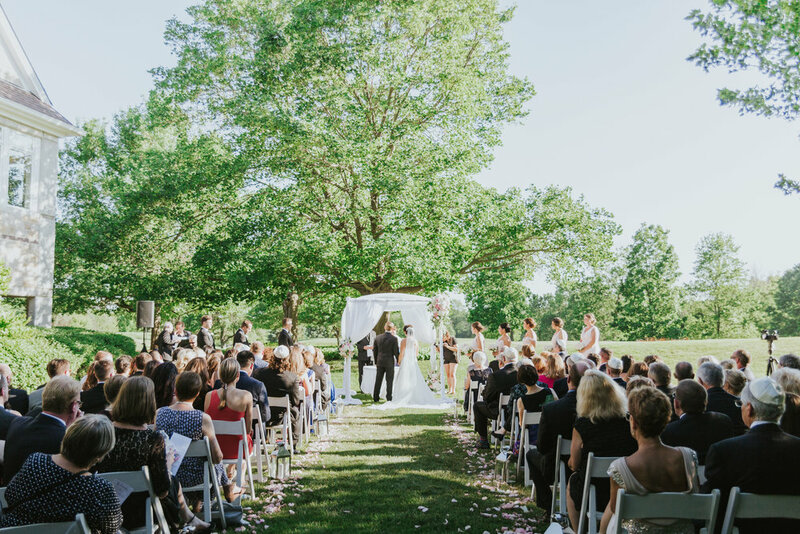 This had always been her dream, she worked hard to find a gorgeous outdoor ceremony site, and during the walk-through we perfectly arranged the guest seating and the huppah under the most beautiful, full tree. It was going to be amazing - but then, on the day of the wedding, there were wind gusts of over 35mph! The huppah would not stay standing, the fabric kept blowing all over the place, and it was basically a mess. The venue coordinator and florist, not truly knowing the bride, strongly pushed to move the ceremony inside, but I put my foot down because I had that relationship with the bride and understood the significance to her. I was confident that she would be fine if we took some fabric off the huppah and had staff stand by in case it started to move... as long as they were outside. A few weeks later when I told her the story during our recap meeting and she was so grateful I made that decision. The pictures and the day were amazing, the huppah didn’t blow away, and the bride got her wish! If you aren’t sold yet: I also had a groom last year who I learned through the planning process was very stressed by the concept of time (he always wanted to be on time), so the idea of a timeline added a lot of pressure for him. Because I learned this early on, I was able to build in about 15 minutes of padding between all big events on the day of so that he would never feel rushed or late. If I hadn’t spent that upfront time with him I wouldn’t have known that, and he would have been stressed the entire day. He told me at the end of the wedding that he actually loved having a timeline - I call that a win! I am available to my clients for random questions and musings (or freak outs) as soon as the contract is signed. For my month of clients, I don’t manage everything (vendors, contracts, etc.) until about two months out, but I am still available to bounce ideas off of and serve as a check to make sure right decisions are being made. The month before your wedding is “go time”. All vendors have a ping on their calendar that says to reach out to you for details of the day. Most of the details they ask for are the same, just in different formats. You could spend hours filling out the different forms! Two months before the wedding, I sit down with my couples and talk through all the questions I know they will be asked. Then, when the time comes, I take those questionnaires over for my clients. Believe it or not: I exchange an average of 250 emails for each month of coordination client I have! What does that mean? I create a timeline catered to your preferences, ensuring a smooth day for your guests, and factoring in details a non-planner wouldn’t think of like vendor arrivals (AKA I stop the band from arriving at the same time as the caterer since they both need the loading dock). I take pride in architecting a day for you to enjoy that isn’t completely overtaken by photography, or catering, or any other item that should only be a piece of the bigger puzzle that is your wonderfully exciting wedding day. Needing a day of planner is a “big little lie”. Any legitimate planner will agree - month of services, though a bit more expensive upfront, will truly allow you to make the most of your investment across the board. 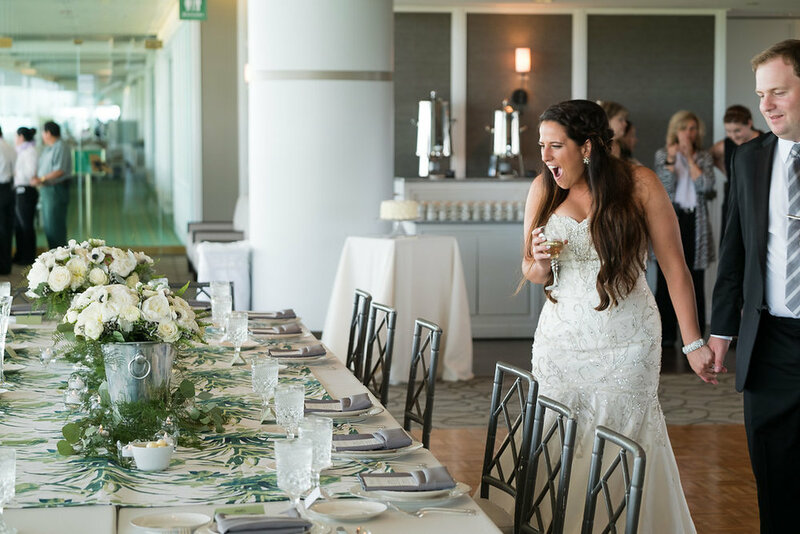 I know that was quite a bit to take in, so please don’t hesitate to reach out if you want to learn more about month of coordination or what Haviland Events can do to contribute to your special day! Click here to inquire or here to learn a bit more about me. What Not to Skip When Having a [Super] Small Wedding! 1. Hire an amazing photographer. This is the first and most important. Just because it’s small doesn’t mean you don’t need amazing pictures to cherish forever and pass down to your grandchildren. Look for a photographer who will allow you to hire per hour and schedule them to be there for the ceremony and to get some photos afterward. Think about what is important to you in that day and have amazing photos taken of that. 2. Invite only the people you want. Maybe it’s just the two of you; maybe it’s your immediate families; maybe it’s some friends. Whatever you decide, make sure you aren’t inviting people just because you feel like you have to. Invite them because they are a special part of your lives and you love them. If you get any questions about the wedding, just be open with people and own your decision. Simply explain you’ve decided to have a very small wedding and leave it at that. There is no rulebook on who you HAVE to invite to a wedding. It’s your wedding after all! 3. Get a really gorgeous bouquet. There’s something about flowers that just feel bridal. Your wedding day is a special chance to carry a bouquet, so make sure to budget for it and get the most perfect one you could ever imagine. If a bouquet isn’t your thing then consider a floral crown, or spend extra money getting your hair and makeup done. The point is: treat yourself and take advantage of this once-in-a-lifetime opportunity. 4. Wear a dress you love. It doesn’t have to be expensive, brand new, or even white, but choose a dress that YOU feel amazing in and suits your personality. It’s your day and you want to be comfortable and confident! 5. 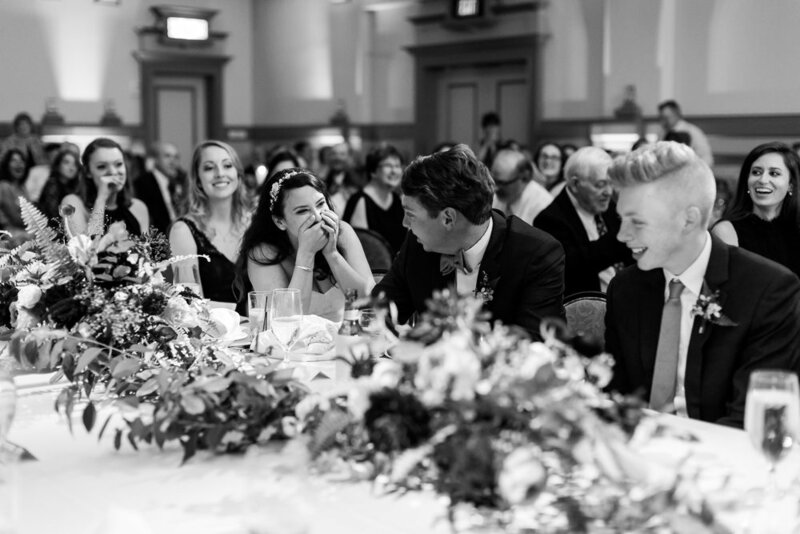 Do something fun and memorable after the ceremony. Whether you have a small ceremony at a church, or a courthouse wedding with just a couple family members, make a reservation somewhere special (for lunch, dinner, or even just dessert) for afterwards to keep the celebration going with your guests. You may be thinking “the reason I wanted a small wedding was so I didn’t have to buy everyone dinner” and it’s perfectly appropriate to have each guest pay their own bill. These are your closest family and friends and they will understand. Just be upfront with everyone in advance so they know what to expect and, I promise you, they will just be excited to be included in your day. Thinking about having an intimate wedding? I’d love to help and I’m offering a special rate through September 30th for anyone having a wedding fewer than 30 guests. Shoot me an email (kelley@havilandevents.com) and let’s set up a time to talk about your vision!